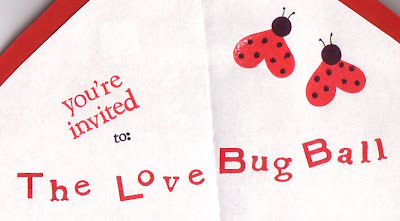 Invitations are made by cutting large heart shapes (folded in half) out of red cardstock. 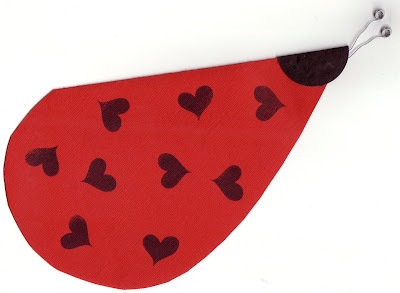 Use a slightly smaller white heart glued inside the red heart, for the party info inside. The hearts should be upside-down when you put on the information. I used Close to My Heart acryllic alphabet stamps. The nice thing about using these for invitations, is that once you have spelled everything out on the acryllic block, you can quickly stamp all of the invitations. 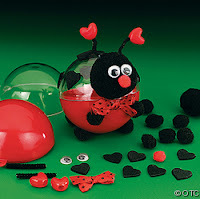 The exterior of the bug is made by stamping black hearts on the red cardstock, attaching a folded black circle for the head, and attaching the curled wire antennae. Upbeat arrangements of Disney songs found on the Disneymania series of CDs. Check out the Cheezy Ritz Ladybug from Kraft foods. Here is a fresh option from Family Fun. 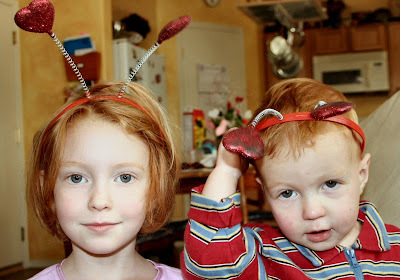 This could end up being more fun than all that mooshy romance stuff that everyone else is doing for Valentine’s Day! Enjoy!